You aren’t after the glitz and the glamour. You aren’t Beyoncé! You are after one thing and one thing only: security. You want a fence that will help protect your Northern Virginia business or home. You want a fence that will keep unwanted guests at bay. You want a fence that doesn’t cost an arm and a leg. You want a lot of things, but there is only one thing you need: a Chain Link Fence. Security: Chain link provides a level of security that is second to none. Durability: The chain link fence is the workhorse of the fence industry and is available in multiple grades and strengths. 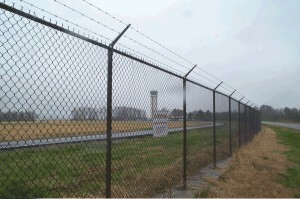 Low Maintenance: Unlike other fencing materials, chain link is EXTREMELY low maintenance. Cost: Chain link fencing is extremely affordable, making it ideal for cost-conscious homeowners. They are cheap to install and even cheaper to maintain. You can also purchase plastic slats to make your chain link fence much more private. Hercules Fence is the largest fence company based in Northern Virginia, affording us the ability to offer you a premium quality fence without the premium price tag. Since 1955, Hercules Fence has been providing professional chain link fence installation and services throughout the state. We offer two primary types of chain link fencing: Vinyl Coated and Galvanized. While you are here, please take a moment to browse our many other residential and commercial fencing options. Let Hercules Fence of Newport News help you find the new fence that best fits your wants, needs, and, most importantly, budget. If you have any questions about finding the right Chain Link Fence Company in Northern Virginia, you can contact Hercules Fence today by calling (757) 316-3600 or visit FencesNewportNews.com today! You can also follow Hercules Fence on Facebook, Twitter, Google+ and YouTube. This entry was posted on Tuesday, May 6th, 2014 at 3:44 pm. Both comments and pings are currently closed.